While I am definitely slowing down now at week 39, I wanted to share that many CrossFitting women can continue working out all the way to due date or at least as long as feels good with their body--like I did until just a couple of weeks ago. 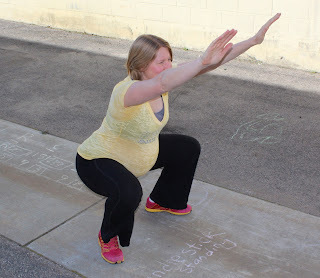 Although the third trimester brought back a bit of fatigue like I felt in the first, I still CrossFitted and did work around the house and yard up until about the 37th week. not squatting with weight at very high speed (i.e. 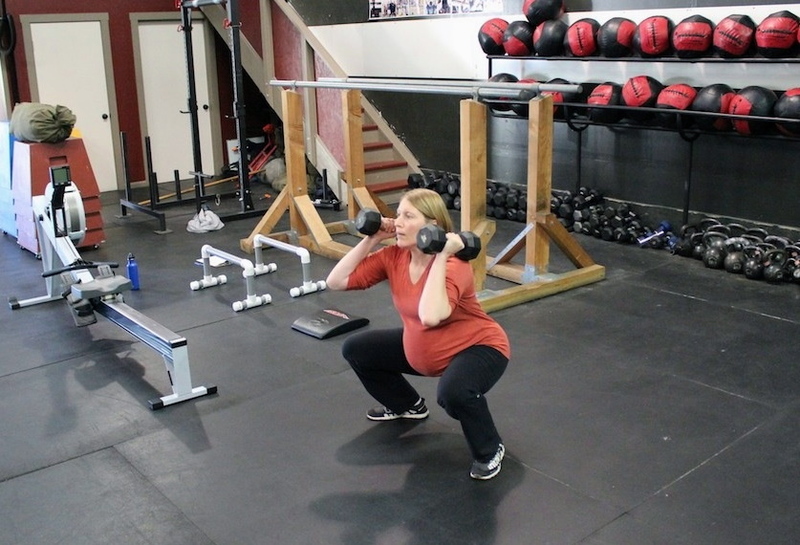 no full squat snatches or cleans) since I have heard of women having ligament issues with that during pregnancy. However, I did do weighted front squats, back squats, overhead squats, and snatches and cleans landing in the power position. And I transitioned to using dumbbells instead of the barbell once I realized I was arching the barbell way out to get it past my belly and returning it was belly-skimming sketchy. and finally scaling down to stretching in the final weeks when opening, softness, and readying the body for birth is the goal (setting aside my CrossFit brain for a time to not be concerned with weight, reps, or time--which is really hard!). Rapid hip opening leads to round ligament pain in me so intense I have to stop and wait it out before continuing to straighten. 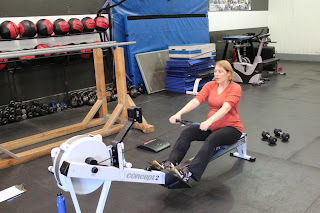 That happens when I try to get up too fast (I need to slowly transition from the rower or just from sitting to standing), bear crawl then try to stand, or when I open and close my hips with too much intensity and repetition--like long, hard rowing. To avoid it, I know I can row a 250 with intensity, so that is my distance of choice, or I can go long and slow if I want to stick out a 500 or 1k, but I have to be really slow getting off the rower and stand up slooooowly. And to note: round ligament pain is completely normal when you belly is quadrupling in size and latched in place by just a few ligaments. Holding my breath is a no-no (it makes me dizzy and isn't good for the baby), so no more slow, heavy lifting. I can go lighter and move quicker while holding tight and breathing at the beginning and end of the movement or breathing while holding tight during the movement if I stabilize tightly. 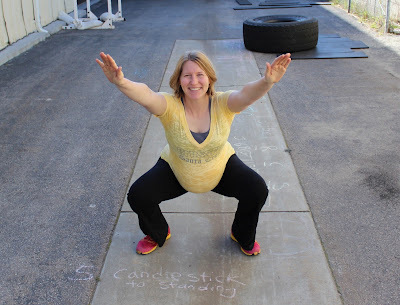 I have to lift things off the floor with wide leg position and row with bowed legs too--which makes me laugh since I feel like a pot-bellied heavy lifter. Overall, I surprise myself with what I can still do and how it makes me feel--I love it. Even though I am not CrossFitting now, I can still walk and lift and move things around the house that are reasonable. I just learned to take the intensity down a notch to not get seriously winded and I feel out the movement--if I get ligament pains, I slow down or stop if necessary and wait them out to continue. A lot of it is just feeling it out and using common sense. Like with eating when I'm hungry and trying to provide my body with fuel not junk--I listen to my body. For the yard projects, in my third trimester I helped haul concrete chunks from the cracked slab we removed from our backyard, spent hours spreading mulch from our landscaping project, and helped shovel 4 cubic yards of granite base rock for the new patio, which my husband put in with the help of our friends on a weekend. I single-handedly moved a woodpile across the yard--just me and the wheelbarrow. Who says pregnancy needs to be a time of rest? I am so lucky to have not had the quintessential pregnancy back pain. I credit my level of fitness obtained over years of getting expert CrossFit coaching at CrossFit Santa Cruz to help drill midline stability and make lifting with a straight back second nature. I am careful lifting to not go too heavy and strain my back that already has such a load to support on a daily basis. But I certainly still lift--it's functional and necessary to life. I love shocking the check-out clerks at the grocery store as I string multiple bags from my body like a Sherpa--"Nope, I don't need any help out today, thanks!" 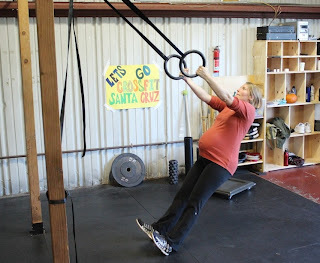 I have also noticed that my recovery during pregnancy is truly amazing and much more accelerated. The speed at which I recover when I do feel a little sore and how rare soreness is for me now is truly remarkable. Another wonder of pregnancy! I continued taking 5g of omega-3 fish oil a day for most of my pregnancy, but started to decrease that to just over 1g by the end so that I don't overly bleed during delivery and recovery (fish oil thins the blood and I have found that especially true with my body). My soreness now in the final weeks is mostly upper back strain counterbalancing that medball-sized 50# weight in front and leg numbness/cramping, which is just my uterus squishing nerves in there. Normal, but annoying. But I must admit: at week 39 and 3 days I am getting more and more uncomfortable, which is a good thing. I have LOVED being pregnant and have felt wistful about losing the amazing feeling of having my little one so close and squirming and hiccuping inside. I already feel like I will miss that intimacy, the happy cocktail of hormones that have made me feel amazing and literally glowing, and the mental time-off from caring about body image. But as the end approaches, I am happy to be about ready to leave behind my amazing pregnancy and embark on a whole new journey of discovery and wonder at my little one. I can't wait to meet him and share the world with him! So the moral is: basically eating healthy, home-cooked foods and exercising using functional movements really does help a pregnancy go smoothly and become a wonderful, fun experience? Go figure!